Cloudy with periods of rain. High 63F. Winds light and variable. Chance of rain 100%. Rainfall near a half an inch..
A steady rain this evening. Showers continuing overnight. Low around 50F. Winds NNW at 10 to 20 mph. Chance of rain 100%. Rainfall near a half an inch. 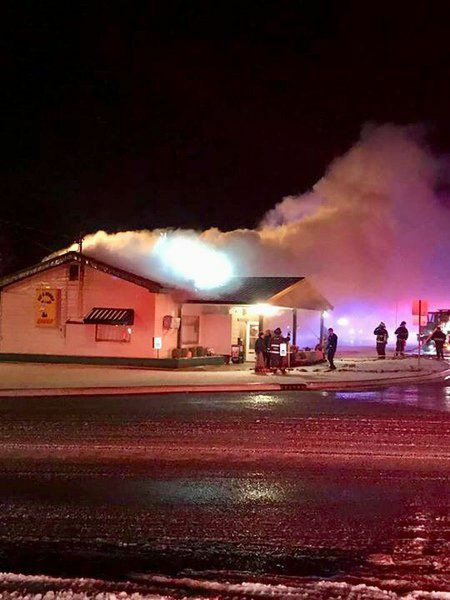 Submitted photoSullivan County’s Kat-a-Korner Diner at Indiana 54 and Section Street (old U.S. 41) was destroyed by fire late Wednesday night. The fire apparently began in the kitchen area and remains under investigation, although foul play is not suspected. No one was injured. 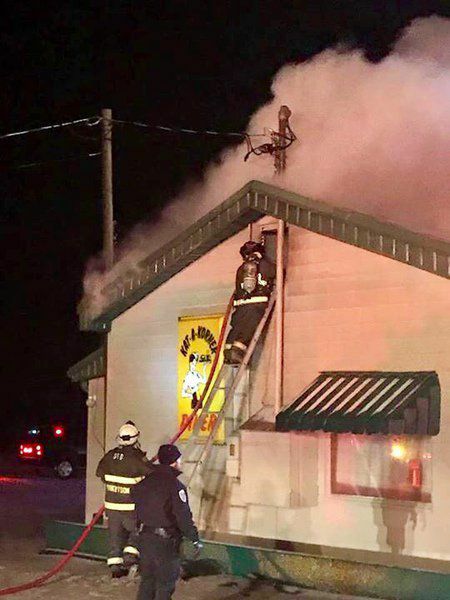 Submitted photoPutting it out: Firefighters attack a fire at Sullivan County’s Kat-a-Korner Diner at Indiana 54 and Section Street (old U.S. 41) late Wednesday night. Sullivan County’s Kat-a-Korner Diner was lost to an overnight fire, but the owners said they are planning to rebuild. Sheriff Clark Cottom said an alarm came in at 11:50 p.m. Wednesday. The first emergency crews to arrive reported heavy smoke and flames showing in the three-alarm battle. Early indications were the fire started in the kitchen area. Cottom on Thursday afternoon said the investigation into the cause was continuing. Sullivan Fire Chief Robbie Robertson said the Indiana State Fire Marshal is expected to continue the investigation into the cause of the blaze. There were no early signs of foul play, and no injuries were reported. The landmark building, located at the corner of Indiana 54 and Section Street (old U.S. 41), was a total loss. Old timers said the restaurant got its name because it sits at an odd angle, Cottom said. 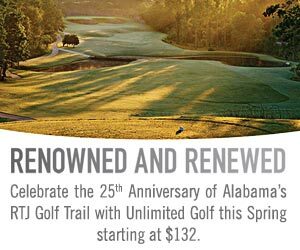 No one knows why the original owners intentionally misspelled the name. Whatever the reason, it’s part of why people have flocked to “the korner” for generations, he said. Sullivan City Fire Department was assisted by Thunderbird Fire Department and Haddon Township Fire Department. Also assisting were personnel from Sullivan County Ambulance, Sullivan City Police and the Sullivan County Sheriff’s Office. The diner has been serving home-cooked meals at the same location on the south side of Sullivan since 1933, Cottom said. It was famous for its biscuits and gravy, chicken and noodles and Friday night fish. “Folks don’t come to the Kat-a-Korner for the food. They come there because it’s the Kat-a-Korner,” the sheriff said. A Facebook post on the Kat A Korner Diner page thanked the public for its support of the restaurant. “As heartbreaking as this is, we will push through and rebuild,” the message said.